We love a Michelin Star restaurant as much as the next foodie, but every great meal doesn’t have to be accompanied by crystal, china and white tablecloths. Sometimes the best food is messily eaten on a park bench, in between a museum visit and a shopping excursion. That’s right, we’re talking about street food. The way to the heart of a culture is through your stomach, and the soul of any international cuisine is street food. It’s delicious, authentic comfort food, and experiencing it is a must for most travel lovers. Seek out unique specialties the locals love – look for the longest lines! Ask the proprietor for his or her favorite menu item. Must-have items in your bag: Napkins, bottled water (complimentary onboard our ships), portable wine glasses, and antacids. Have an open mind! It’s always fun to try something new. After extensive research (eating delicious meals all over the world) we’ve developed this guide to the best destinations for street food. Enjoy! Thailand tops many lists of travel destinations for foodies, and for good reason. In particular, Bangkok is a culinary wonderland. Pad Thai, satay, curry rice – the list of street food delicacies goes on and on. Noodles ordered naam come with broth while noodles ordered haeng come dry. A variety of meat options are usually offered, and condiments include chili, fish sauce, and ground peanuts. In Bangkok, visit Chinatown (or Yaowarat as it’s known locally), Old City, Bang Rak, and Khao San Road for great street food options. Azamara has several upcoming voyages calling on Bangkok. If you ask us, Spain’s best street food is a dessert: churros. These fried, skinny pastries are rolled in sugar and then dipped in a cup of thick hot chocolate. Delicioso! Sandwiches called bocadillos are also popular – simply meat and cheese tucked between two pieces of crusty baguette. They make the perfect lunch for a quick break from sightseeing! In Barcelona, get a taste of local culture at one of the city’s many food markets – there are over 40 of them, with more than 10,000 different stalls! The most famous of all is La Boqueria in Las Ramblas. It’s touristy but charming. This June 2017 voyage calls on Barcelona, as well as three other Spanish ports. Mexican street food is called antojitos, which translates to “little cravings”. But after you’ve experienced it, you’ll have a big craving for these tasty treats. Mexico is known for having some of the best street food in the world. The most famous Mexican street food dish might is the taco, which has taken the rest of the world by storm. But there’s much more to explore! Tamales, tostadas, tlayudas – and that’s just the Ts. The fillings for tacos can vary among vendors, particularly from region to region. Beef, mutton, and chorizo are all quite common. Toppings include salsa, cilantro, lime wedges, and green onion. Tamales are made of masa, steamed inside a corn husk with a combination of meats, cheeses, fruits, vegetables and chilies. Tostadas are fried or toasted tortillas, often topped with similar ingredients as tacos. Tlayudas are also crunchy fried or toasted tortillas, topped with refried beans, lard, lettuce, avocado, shredded meat, Oaxaca cheese and salsa. Elote is corn on the cob served on a stick with condiments including salt, butter, cheese, lime juice, or crèma. Carnitas are braised pork, and a popular taco filling. Gorditas are small cakes made of masa and stuffed with cheese, meat, and other fillings. Quesadillas are wheat tortillas filled with cheese, meat, and vegetables and cooked on a griddle, then folded in half. Try them all when you visit Mexico! The 14-Night Exploring the Isthmus Voyage in 2017 and the 14-Night Costa Rica to Baja Voyage in 2018 both call on five different Mexican ports. Israel is bursting with great street food, the most iconic being falafel. When you visit, ask locals for their favorite nearby stall and choose a place that serves freshly fried falafel. Hummus is another must-try item – you’ll be astounded by how much more flavorful it is than hummus purchased from a supermarket back home. Israel’s “mixed grill” is for more adventurous eaters – a mix of chicken liver, hearts, meat, onions and spices. It’s stir-fried and often stuffed into a pita. If mixed grill sounds too risky for you, try a kebab or shawarma instead. Israeli shawarma is similar to a Greek gyro but made using turkey thighs layered with lamb fat and stuffed into a pita with tahini sauce, pickles, French fries and other toppings. Haifa, Israel is most renowned for shawarma. Visit Haifa and Jerusalem during this October 2017 voyage. Takoyaki, (pictured above), savory balls of batter, filled with octopus. Okonomiyaki, savory pancakes filled with bacon. Yaki Imo, sweet potatoes baked over a wood fire and served from trucks or carts. Tomorokoshi, corn grilled with miso, butter, and soy sauce and served on a stick. Of course, there is also Japan’s famous bento. A traditional bento is a single-portion takeout box containing rice, fish or meat, and pickled or cooked vegetables. Bento is sold everywhere in Japan, including from street stalls. A bento yatai often develops a good reputation through word of mouth, so look for ones with long queues. Italians love to linger over long dinners. To enjoy a true Italian dinner is to spend hours eating multiple courses, drinking several bottles of wine, and enjoying long conversations with friends and family. However, not all foods must be lingered over in such a fashion. At lunch, it’s common to purchase a sandwich from a small shop and eat it on the street, perhaps with a glass of wine. Pizza, cones of fried seafood, arancini (fried risotto croquettes) and fried olives are also popular. And then there’s the gelato. Walk through any Italian city, and you’ll notice case after case of assorted, colorful gelato. Classic Italian flavors include chocolate, pistachio, lemon, hazelnut and stracciatella. Eat your weight in gelato during this September 2016 voyage, featuring five Italian ports. If you’re in Jamaica, you simply must try jerk chicken. It’s not only Jamaica’s most famous street food; it’s one of the most famous street foods in the world. Genuine jerk chicken is not grilled, but smoked over native pimento wood until the meat is falling off the bone. Jerk marinade is a combination of ultra-hot Scotch bonnet peppers, allspice berries, green onions and fresh ginger. Jamaican patties are also sold at food stalls. These flaky pastries are traditionally filled with seasoned ground beef, but vegetable and chicken options are often served. Azamara has three upcoming voyages to Jamaica. Hong Kong takes street food seriously. In fact, Hong Kong’s street food game is so next-level that Michelin is recognizing it for the first time in their 2016 Guide for Hong Kong & Macau. Bustling street food stalls called Dai Pai Dongs line the streets of every neighborhood, resulting in a mix of sights, sounds, smells and tastes that will astound your senses. In the Kowloon neighborhood, the Temple Street market comes alive at night. This is a place for adventurous eaters – you’ll find vendors selling fried seafood, organ meats, chòu dòufu (also known as “stinky tofu”) and siu mai, steamed pork dumplings. Azamara has several sailings to Hong Kong planned throughout 2016, 2017 and 2018. Greece’s most famous street food is the gyro. Meat for gyros is cooked on a vertical rotisserie, and served in a pita with tomato, onion, fries and tzatziki. Though grilling meat on a skewer has ancient roots, the process of grilling meat vertically and removing slices as it cooks was developed in the 19th century. Souvlaki, cheese pies and koulouri (crunchy rings of bread sprinkled with sesame seeds) are also popular Greek street foods. Browse voyages to Athens, Greece. Turkey’s answer to the Greek gyro is the döner. Like a gyro, döner meat is roasted on a vertical spit and removed in thin slices. Then, it is served in a flatbread or inside a crusty roll and topped with tomato, onion, pickled cucumber and chili. The difference is in the sauce and the seasonings. Mısır is corn on the cob, grilled and served with salt and spices. This snack is sold only during summer months, by vendors in carts. During colder months, these vendors instead sell roasted chestnuts, or kestane. For more must-try Turkish street foods, check out "Five Things To Do In Istanbul". Pakoras, crispy chickpea-battered vegetable fritters. Samosas, fried pastries usually filled with spiced potatoes, onions, and peas. Aloo tikkis, potato croquettes served with chutney, tamarind and coriander mint sauce. Vada pav, a deep fried potato patty served in a bread bun, with green chili peppers and chutney. If you want delicious Indian street food, look no further than Mumbai, a city renowned for distinctive and delicious street food. In this city of over 20 million residents, you’ll notice that people of all economic classes enjoy roadside food. In fact, many locals insist the food from Mumbai’s street food is better than that of restaurants. Visit India during the Spice Route Voyage in November 2016. If we had to choose one ultimate destination for street food lovers, it would be Vietnam. First, feast on fresh spring rolls, or gỏi cuốn. Since these rolls are not fried, they make for a healthier snack than many other popular street foods. Phở: Flat noodles called bánh phở with broth, herbs and either beef or chicken. Bún ca: Fish soup in broth, poured over vermicelli noodles. Bún bò Huế: Beef and pork bone broth, flavored with shrimp paste and lemongrass. Bún riêu: Pork broth with tomatoes, egg dumplings, and crab. In Ho Chi Minh City (also commonly known as Saigon) you’ll find most of these delicious local treats at the bustling Ben Thanh Market. Arrive early and bring your bargaining skills. Visit three different ports in Vietnam on this December 2016 voyage. Walk down the street in any German city and you’ll notice food vendors selling that iconic German treat, the pretzel. Known in German as a brezel or breze, this twisted bread has been a part of German baking for centuries. The pretzels are often topped with sesame, poppy, sunflower, pumpkin or caraway seeds. Sweet pretzels coated with cinnamon sugar are also popular. Another incredibly popular German street food is bratwurst. You’ll see – and smell – these sausages being smoked and grilled at stalls along German streets. Bratwurst varies a lot by region – there are upwards of 40 different varieties to try! Visit Warnemunde and Berlin on any of these upcoming voyages. Malaysia offers a fascinating mix of cultural influences. George Town, located on the island of Penang, is a renowned foodie paradise, especially when it comes to street food. You’ll notice traditional Malay cuisine with influences from China, India and more. Try char koay teow (stir-fried noodles), congee (a milky rice porridge, served with fish, port or vegetables), dim sum and satay. Satay is perhaps the most iconic Malay dish, meat kebabs cooked over charcoal. In George Town, visit New Lane, a street lined with over 50 street food stalls. In Kuala Lumpur, find Jalan Alor in the heart of the city. 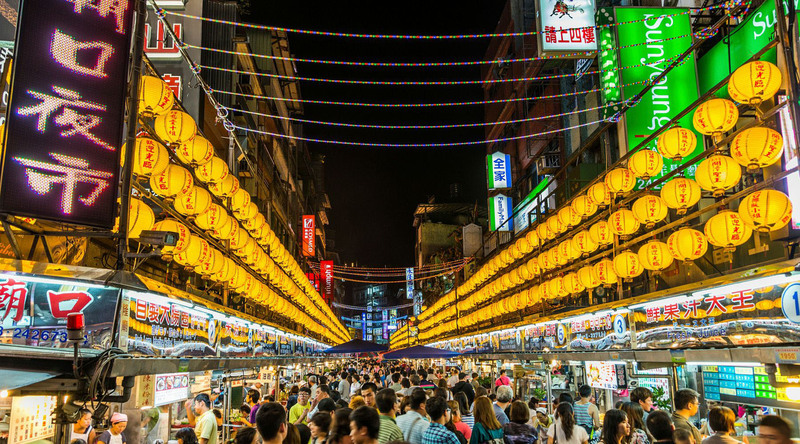 At night, it comes alive with bustling food stalls serving both locals and travelers. Here, you can find almost any Malay, Chinese or Thai dish imaginable – so bring your appetite. Visit Kuala Lumpur and George Town on this April 2017 voyage. Belgium may be small, but it packs a culinary punch. The country has the highest density of Michelin Star restaurants of anywhere in Europe, but its street food scene is just as renowned. North Americans may use the term “French fries”, but it’s more likely that the dish originated in Belgium. Today, Belgian frites are served in paper cones from stalls and dedicated fast food restaurants called friteries. If you have a sweet tooth, Belgium is the place for you. Waffles are another common street food. This decadent treat can be topped with fruit, nuts, whipped cream, Nutella, and more. Churros and a variety of Belgian chocolate treats are also popular. Azamara has voyages calling on Antwerp, Oostende, and Bruges. Singapore is known as the birthplace of food stall centers. One of the most famous open-air markets in the world is Old Airport Road Food Centre, where you’ll find thousands of food stalls selling every kind of Asian dish imaginable. Seek out Hainanese rice, or as it’s also known, chicken rice. There are more than five million people in Singapore and they all have an opinion on who makes the best dish. While there, ask locals for their recommendations! Other local delicacies you don’t want to miss are chili crab, white pepper crab, cze cha duck rolls and hokkien mee (pictured above). Like Kuala Lumpur and George Town, Singapore’s pan-Asian cuisine has been influenced by Chinese, Indian and Malay flavors. Spicy noodles, sizzling satay, steamed pork buns and delicious dim sum are also popular in Singapore. Azamara Club Cruises has many voyages calling on Singapore in 2016 through 2018. What's the best or most interesting street food you've ever tried? Let us know in the comments section!